The Best preserved Bodhigaraya of Anuradhapura period. Nillakgama Bodhigharaya is one of the few Bodhigarayas that is still existing in the island with almost complete stone architecture built around 8th or 9th Century AD. 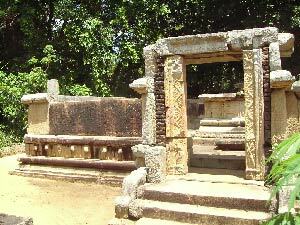 This belongs to the Anuradhapura period and the prominent archeological site Yapahuwa is situated about 10 miles SW. This is located at a remote place where it is difficult to come across without taking directions from the people in the locality. Here is how to travel upto Nillakgama Bodhigaraya. Proceeding along Kurunegala-Puttalam Road, come to Maho junction either from Padeniya or Nikaweratiya. Passing Saliyagama along Galgamuwa- Moragollagama Road proceed up to Gallewa Mosque. Come about 5 km along road to Hettigama. Then passing Nithalawa School proceed about few hundred feet and come to Hettigoda Village where the Bodhigaraya is situated by the Tank. Another approach is from a turn off from Bimpokuna Grama Sevaka office and proceeding about 2 km inside where you come across the tank. One can also come from Galgamuwa to Gallewa Mosque. The dimentions of Nillakgama Bodhigharaya is as follows. The outer Granite square measures about 32.5 feet x 32.5 feet , the entrance is 6.5 feet wide. The outer wall is 7 feet high and the inner Bodhi Tree granite stage outer size is 13 feet x 13 feet at bottom and 10 feet x 10 feet at the top. The thickness of the outer granite wall slabs are 8 inches thick. Click on Thumbnail Photos to see full size image and the photo description. 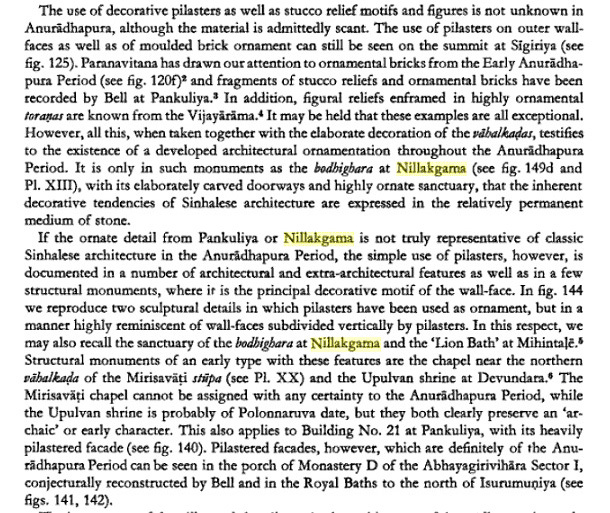 -------An expert's view on Nillakgama Bodhigharaya architecture..